The CW Network’s The Originals, a spin off from the popular Vampire Diaries, featured a go game between two characters in a key scene this week. Perhaps after MTV’s stylish use of go in repeated episodes of Teen Wolf last year, the CW thought they would get in on the action as well. Original vampire Klaus Mikaelson (Joseph Morgan), the vampire who made almost all other vampires, is seen playing go with Marcel (Charles Michael Davis), a vampire he sired in the 1800′s who then became his enemy in later years. The game represents a kind of detente between the two characters, in their ongoing fight to control New Orleans, and prevent the witches, the werewolves, and the humans from getting the upper hand. E-J reader Xinming Simon Guo says the game featured is a famous one, and challenges readers to see if they can identify it. The entire episode can be streamed on the CW website here, the go game is about 21 minutes in. -Paul Barchilon, E-J Youth Editor. 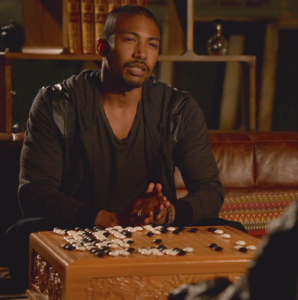 Photo from the CW website: Charles Michael Davis playing go.